The lights are all off, it’s the middle of the night, and a chill runs up your spine. This can only mean one thing. It’s a brand new article series from yours truly! Greetings and welcome to the Scare Factor, where I spout wild theories about why certain things are scary. I want to emphasize the “wild theories” part of that. These articles will consist of my personal analysis on why certain beings, situations, or places are scary. I’m not doing any real research for these articles. I’m basically taking a shot in the dark. That being said, I welcome any alternate theories with open arms! Simply comment below with your thoughts. Now, onward to horror! For those of you not in the know, one of my favorite monsters of all time are the Weeping Angels from Doctor Who. If you’ve never seen the show, the Weeping Angels are basically beings that appear to look like statues. That is, they appear to look like statues as long as they are watched. But the moment you avert you eyes, the second you blink, BAM, they are right in your face. The reason for this is that they move so fast while they’re not being seen that they cover the length of a room in a blink of an eye. For this reason, they are terrifying. They move faster than you can even blink and they will get you no matter what. 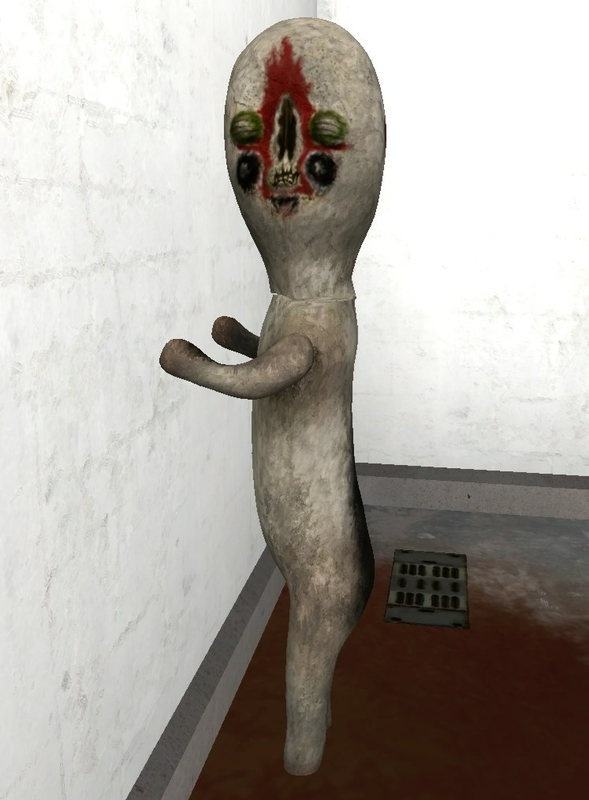 The computer game SCP Containment Breach contains a character like this as well. The main monster of the game is SCP- 173, a cement statue of a bizarre looking humanoid-ish creature. The creature is usually completely still until the moment the player’s character blinks. Then, he is suddenly right in front of you, trapping you in a corner with no way out. The very next time you blink, CRACK, he breaks your neck and you’re dead. Knowing what I know about the above two creatures, I started thinking about what makes them so scary. They are obviously based on the same premise: a creature that can’t move and is relatively harmless until the moment you can’t see them anymore. But what makes them such good horror monsters? What makes the episode Blink and the game Containment Breach so scary? I think it all revolves around one word: Inevitability. Blinking is an outright necessity for human beings. It re-moistens the eyes which continues our ability to see. And think about how often people blink. Again, I’m not doing any research for this, but I’m betting it’s at least 5-10 times a minute. People don’t even think about blinking. It’s just an automatic muscle movement. But take that away, force someone to stare at someone, and it just gets harder and harder by the second to keep those eyes open. Eventually, the person will just have to blink. It’s simply something that people can’t control. Also, it doesn’t even take a second to blink. I think it takes longer to say the word blink then it actually takes to blink. So, the idea that something can move so quickly that in the span of a single blink they can move from across the room to right in your face is mind boggling. They move with such quickness that it just seems sudden. One moment you think you’re okay and the next you’re in immediate danger. I think one of the things that makes these creatures scary is that they are quicker than anything and there’s basically nothing we can do to stop them. So, a person hears about these monsters and thinks to themselves “Fine, I’ll just stare at them forever and they can never move.” But that just won’t happen. Because blinking is inevitable. I think what makes these situations and monsters so scary is that safety becomes impossible, or at least highly improbable. Eventually, your eyes will wonder, or you will blink, and when your eyes reopen it’s already too late. In my humble, unresearched opinion, I think there are two reasons for these types of monsters to be terrifying: The inevitability of blinking and the incredible agility these creatures show. Both these things make for one scary creature you wouldn’t want to be caught with in a staring contest.